Also see the 11-volume Bullinger collection! Add these seven new Bullinger titles to your collection today! This set is filled with challenging questions and answers on controversial issues such as biblical prophecy, end times, and numbers in scriptures. Follow along as Bullinger guides students on an expedition of his twelve practical principles of Bible study and interpretation in How to Enjoy the Bible! 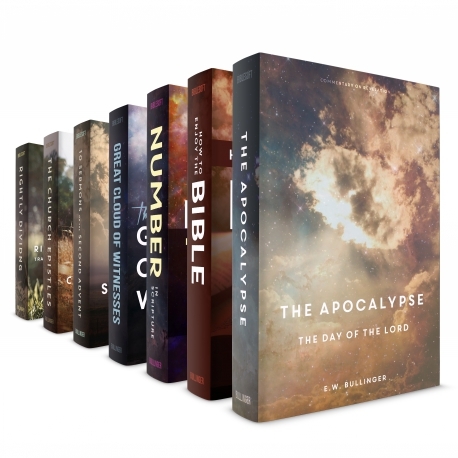 A true classic, Commentary on the Book of Revelation also known as the Apocalypse or The Day of the Lord is written from a dispensational viewpoint but seeks to provide a full analysis of the structure and linguistic features of the book. It was first published in 1902, a time period which saw a renewed interest in the study of Bible prophecy and especially the book of Revelation. A perennial bestseller and the definitive guide to the study of Bible numeric. Over 150,000 in print! Bullinger's two-fold approach to the subject of biblical numbers first examines the supernatural design of the Bible. He notes the patterns and numerical features of the Scriptures that are evidence of their Designer. The second section highlights the spiritual significance and symbolic connotations of numbers that are repeated in different contexts throughout the Bible. The Great Cloud of Witnesses is a classic exposition that includes an examination of the great heroes of the faith. Full of rich, practical applications. In this excellent and truly classic exegetical study, distinguished scholar E. W. Bullinger examines great heroes of the faith: Noah, Abraham, Sarah, Isaac, Jacob, Moses, and many others. Their shining examples show believers today how faith can be lived daily and purposefully. In Great Cloud of Witnesses, Bullinger provides a trustworthy and encouraging read that will strengthen the minds and hearts of preachers and followers alike. A comprehensive treatment of the second coming from both the New and Old Testaments. There have been many books written on the prophetic discourses of our Lord Jesus in the Gospels. However, Bullinger, with his distinctive and different insight, has approached these verses in a very different way. Here we are given a good overview of Romans, 1 & 2 Corinthians, Galatians, Ephesians, Philippians, Colossians and 1 & 2 Thessalonians. E W Bullinger wrote a series of articles in the magazine Things to Come on The Church Epistles, which were published in this book of the same title. In this work Bullinger stresses the critical importance of accuracy when it comes to the study of Scripture. It is right here then that we need to be careful, and not read into the Word of God ideas out of our own minds which are not really there.